Something to look forward to: Intel’s Optane Memory H10 SSD will be rolling out on newer ultrathin notebooks soon. As such, the chipmaker thought it would be a good time to reveal the drive's specs. What makes the H10 unique is that it is a 2-in-1 SSD. 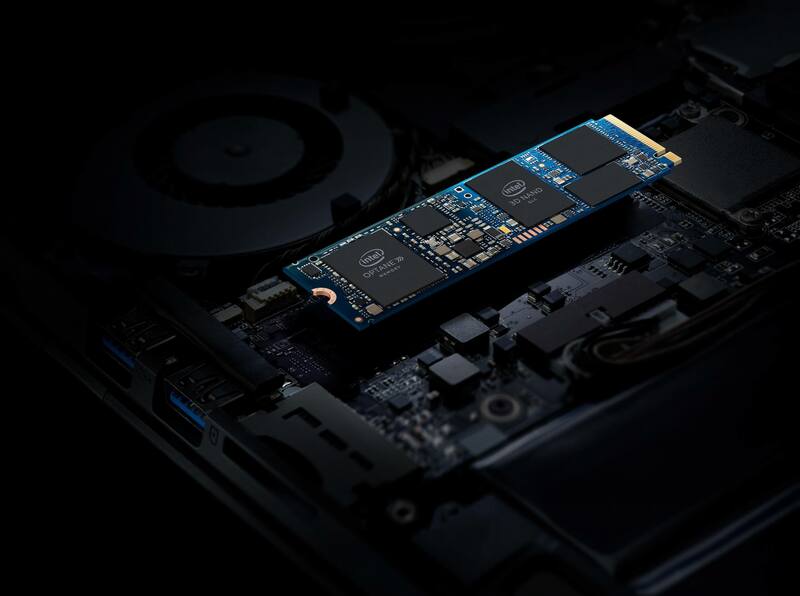 It combines the Optane Memory M10 and the Intel 660p Quad Level Cell (QLC) SSD in a M.2 form factor. The M10 portion will act as a cache for the QLC. Intel’s Rapid Storage Technology Software will provide drivers for caching data. This combination overcomes the challenge that Intel has had with fitting other Optane products into ultrathin notebooks. Optane Memory H10 SSDs will come in three flavors — 256GB, 512GB, and 1TB QLC NAND. The 256GB version will have 16 GB of Optane storage, and the 512GB and 1TB models will have 32GB. All three will be single-sided M.2 cards, and the modules will have a PCIe 3.0 x4 NVMe interface. The Optane and the QLC controllers will split the PCIe lanes. The Rapid Storage drivers will support reading and writing from Optane and QLC controllers simultaneously. Each controller is capable of up to 2GB/s sequential reads on their own, but Intel claims the H10 will be capable of up to 2.4GB/s with the software’s coordination. The I/O rate for the H10 will be 32k random read IOPS, and 30k write IOPS with a queue depth of one, and 55k IOPS r/w with a queue depth of two. Intel says that both of the SSD controllers have single digit mW power consumption when idle, so the overall L1.2 idle power rating is less than 15mW. There are a couple of system requirement caveats to watch out for with the H10. For one, it requires a Kaby Lake or later processor. Not a big surprise since the Optane Memory drivers have always held this bar. The more significant difference here than with past products is that the H10 will require a host slot that provides all four PCIe lanes. Additionally, the port will have to support operating them as two 2-lane ports. Optane Memory H10 also requires Intel’s upcoming RST version 17.2 drivers for caching of course. Expect to see the H10 in systems with a 300-series PCH and 8th Generation Core U mobile processors at launch. The company also said that a retail version will be available at Best Buy and Costco, but did not mention when. All three versions come with Intel's 5-year limited warranty.